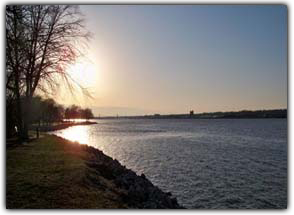 The Quad Cities metropolitan region spans two states along with Mississippi River. Eastern Iowa cities Davenport and Bettendorf are connected by the river to western Illinois cities Moline, East Moline and Rock Island. The Quad Cities lies midway between Minneapolis and St. Louis, and is approximately 165 miles west of Chicago. The region is served by Interstates 80, 88 and 74 and the Quad City International Airport. Rural areas just outside of city limits are made up of rolling farmland, wooded areas, rivers, lakes and streams, giving the Quad Cities some of the most versatile landscapes in the country. These outlying areas are also known for hog, cattle, corn and soybean production. Over the last 20 years local government entities, businesses, non-profits and residents have collaborated to revitalize the community that is deeply rooted in agricultural manufacturing. Today the region has cultural amenities comparable to major cities, abundant outdoor activities, vibrant nightlife and limitless choices for dining and shopping. Housing is affordable and the business climate is favorable to enterprises of all sizes. Moline is home to Deere and Company world headquarters and the Rock Island Arsenal is the largest government-owned weapons manufacturing arsenal in the United States. Palmer College of Chiropractic was founded in Davenport in 1895 and is the largest chiropractic college in the world. Alcoa, Inc., the world’s third largest producer of aluminum, maintains a plant in the Quad Cities and is considered one of the area’s largest employers. 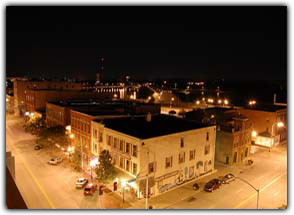 The Quad Cities is also home to college & universities, such as St. Ambrose University in Davenport, Iowa, Augustana College in Rock Island, Illinois and Western Illinois University Quad Cities Campus in Moline, Illinois.